Foot arthritis leads to narrowing of one or more of the joints in the foot and ankle. Arthritis leads to the loss of articular cartilage, which covers the ends of the bones and allows the bones to move smoothly against each other. When the cartilage is damaged, the bones rub together during joint motion, and the patient may have pain. This can lead to pain with motion, clicking, grinding with motion and/or a loss of strength. When arthritis becomes severe, the body attempts to stabilize the joint and limit motion by forming bone spurs or extra bone around the edges of that joint. Patients suffering from foot and ankle arthritis may experience pain, stiffness or loss of strength. A grinding, clicking or locking sensation may be felt in the affected joint. Loss of motion can become severe and the patient may have trouble performing everyday tasks, such as walking. Arthritis is diagnosed by physical exam and X-ray. Your orthopedic surgeon will examine your foot and ankle, noting range of motion, strength and pain with motion. Physical therapy can assist in treating foot and ankle arthritis to strengthen soft tissues that support the joint. The stronger the supporting soft tissues, the less the body will need to rely on bony architecture to stabilize the joint. Therapy may lead to less stress on the arthritic joint. Because arthritis involves inflammation, your surgeon may prescribe anti-inflammatory medications or recommend an injection to reduce the inflammation. For arthritis in its beginning stages, nutritional supplements may slow the progression of the arthritis. When non-operative treatment has failed, your surgeon may suggest surgery. There are numerous surgical options for foot and ankle arthritis. 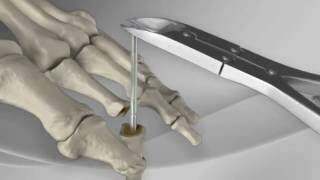 Fusion remains the gold standard in treating arthritis in the foot and ankle. 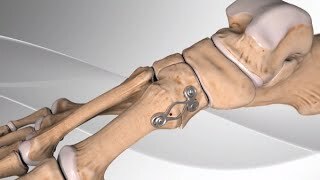 A fusion of the ankle joint will contribute to eliminating the patient's pain. Range of motion of the ankle or other joint, however, is severely limited after a fusion. For older or less active patients, a joint replacement can be performed. This involves removing the joint and replacing the injured cartilage with a metal or plastic implant. This allows the joint to move smoothly, reducing pain and in many cases improving motion. This is a condition characterized by the progressive wearing and destruction of the main joint of the big toe (hallux), which leads to bone-on-bone contact. This abnormal articular damage translates into swelling, pain and stiffness when walking. This condition is commonly referred to as “hallux limitus” or “hallux rigidus”. This degenerative disorder is caused by an increase on the forces that cross the big toe during normal gait. This continuous overload or mechanical stress compromises the natural cartilage that cushions the two articular components of this joint, reflecting the progressive erosion of this articulation. In some instances, traumatic events can cause direct and instant damage to the joint. Patients suffering from this condition may experience swelling, pain and stiffness of the big toe. They will usually try to avoid weight bearing on that foot to alleviate these symptoms. Often times they also complain about the presence of a “bump” on the top of the big toe; this is an abnormal bone growth (osteophyte) that can make shoe wear uncomfortable while limiting the normal gait even more. The physical examination reveals swelling, pain and crepitus of the big toe. Moving the hallux during assessment will increase the pain significantly. Radiographic studies reveal articular damage, loss of the normal articular space, bony erosion and abnormal bony growth around the joint. Early stages of this condition can be treated with shoe modification, shoe inserts and/or anti-inflammatory medications. Injections may also be used to decrease pain. Surgical treatment ranges from arthroscopic joint cleaning, resection of the abnormal bone growth, interposition of different materials to cushion contact between the articular surface components and fusion of the damaged surfaces to alleviate pain.